John Waller dropped by the studio today. 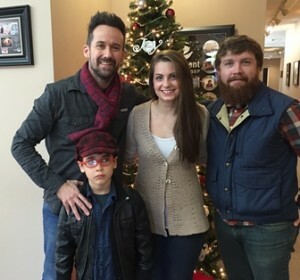 He has a Christmas show on Sunday 12/20/15 at Southcrest Church in Newnan. We talked about his Christmas tour and John did a live version of his Christmas song Of All The Places. John brought his seven-year-old son Zeek with him and Zeek sang Happy Birthday Jesus. Drew Smith, the Creative Arts Director from Southcrest was also in studio, accompanying John on percussion. A portion of that interview, with the live studio versions of Of All The Places and Happy Birthday Jesus, is below, along with a couple of John’s music videos.